English Access Microscholarship Program and Teacher’s Assistant Certificate participant, Karina Alvarado. Karina Alvarado first became eager to learn English as a preteen growing up in Quetzaltenango, Guatemala. At the time, her motivation was simple: she wanted to understand the words to songs she loved. At age 12, Alvarado decided to do something about that. She applied for a scholarship to an English language program offered by the U.S. embassy, but discovered she was too young to qualify. She tried again every year until finally, in 2012, at age 14, Alvarado was eligible to join the English Access Microscholarship Program. Six years later, much has changed. Alvarado is now the head teacher of the Access Program, having taken the leap from student to teacher with help from two of World Learning’s Teaching English to Speakers of Other Languages (TESOL) certificate programs. Her goals have become loftier over the years as well. Alvarado quickly realized that English language skills could help her earn university scholarships. Now she would like to use those skills to improve the lives of others in her country. It was in the Access program that Alvarado first discovered her calling — and opportunities to follow that calling opened up immediately. Alvarado (left) with her mentor and supervisor. Karina credits her mentor as being the inspiration that led her to become an Access teacher. Now, after 5 years, they are working together as colleagues. 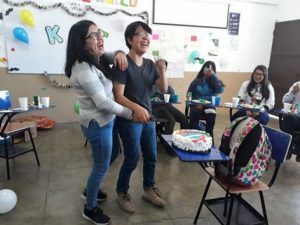 By the time she graduated from the two-year program, the U.S. embassy had launched a pilot program designed to teach Access alumni the methodology to share their new language skills with younger children in Guatemala. 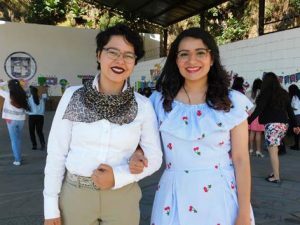 Alvarado earned a spot in that pilot program, where she learned the foundations of teaching English and even taught her first class in a 15-day exchange to the city of Cobán. But it was through two World Learning programs that Alvarado cemented her skills. Last year, she enrolled in the Teaching Assistant’s Certificate course, which World Learning developed with funding from the U.S. embassy to help Access alumni put their new language skills into action and connect to professional opportunities. “Access helped kids speak English, but there was no capstone that would lead them to professional development,” says German Gomez, senior TESOL outreach and development manager at World Learning. TAC could serve as that capstone, connecting students to teaching assistant jobs in their communities. Alvarado’s first group of students in 2017. Alvarado then went on to obtain the SIT TESOL Certificate, which is offered by World Learning’s sister organization, School for International Training (SIT). The SIT TESOL certificate is a 130-hour program steeped in learning theories, teaching methodology, and classroom management with hands-on, trainer-observed teaching practice. Access was still an important part of Alvarado’s life as she worked to obtain the two certifications. She had continued to volunteer with the program over the years and, once she received her TAC and SIT certificates, Access brought her on as head teacher rather than the assistant role for which she’d been training. Alvarado’s class dressed as their favorite fictional characters. Alvarado has already demonstrated that she has much knowledge to share with her students, other teachers in the Access program, and beyond. In her new role, Alvarado teaches a class of 16 students, to whom she aims to impart far more than English language skills. 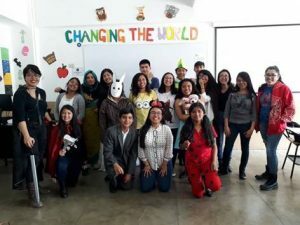 She encourages her students to learn how to solve problems through service learning projects, and she also teaches lessons on history and international affairs to build their critical thinking skills. Alvarado (right) with her assistant teacher. Alvarado’s own goals continue to evolve. 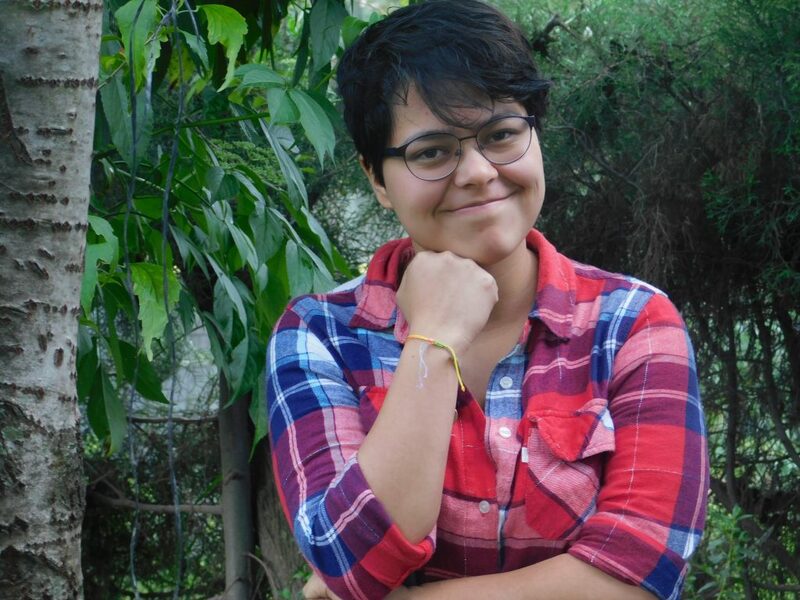 Alvarado is also studying international relations and hopes that someday, in addition to working for the Ministry of Education, she could become an ambassador for her country. 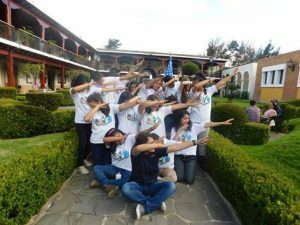 “It would be an awesome opportunity to bring more opportunities for other people in Guatemala,” she says. She’s already well on her way.